Ah… summer. Full of the most delicious tomatoes! I will be so sad when it’s over. What will I eat for lunch every day? No, seriously, I eat this almost every day for lunch. A simple salad made from the freshest local produce. I cannot tell you how much I love eating this meal. You’d think I’d get tired of the same thing for lunch day after day, but I don’t. I look forward to it. I could eat these heirloom tomatoes every day for the rest of my life and be a very happy girl. 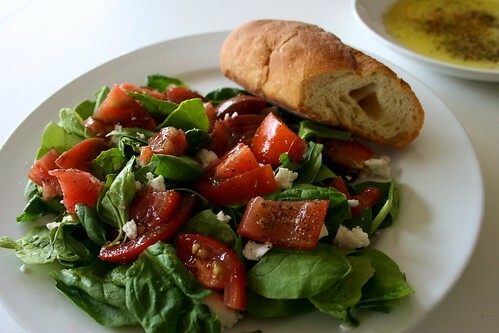 This entire meal including my simple salad, french baguette and seasoned extra virgin olive oil for dipping comes in just under 400 calories. Not bad for a flavorful, very healthy dish! 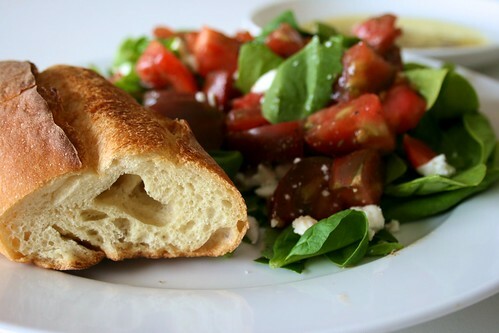 Turn on your oven’s broiler (or use a toaster oven) and place your chunk of baguette in the center of the oven to refresh while you prepare the salad. This will warm the bread and make the outside crusty again if it has gotten stale. For the oil, grab a small plate. Sprinkle a good pinch of kosher salt and pepper onto the plate. You can also grind some Italian seasonings into your mix, or you could chop some fresh herbs like basil or rosemary to add in. Measure out 1 tablespoon of heart healthy extra virgin olive oil and pour onto plate. Use your measuring spoon to mix up the oil and seasonings. For the salad, chop your tomato and toss in a small bowl with salt and pepper. This will allow the juices of the tomato to release and build more flavor. Let it hang out in the bowl a few minutes. Next, rip up your mixed greens and plate. If warming your bread, reach in the oven and flip it over. Now, rip up your basil leaves and toss in with your greens. Crumble fresh Goat Feta over your salad. Top with the tomatoes and juices. This will replace your need for dressing. Now, turn off your oven and remove your baguette. Add it to your plate and enjoy! How do I eat my salad? 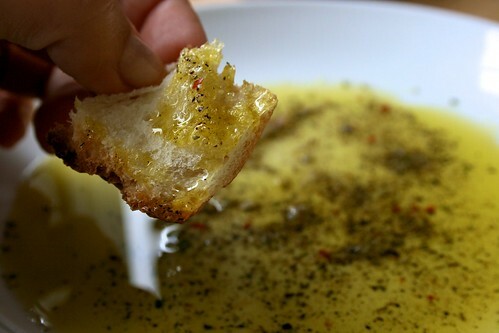 I like to dip a small chunk of crusty bread into the oil and use it to scrap up some salad onto my fork. This transfers some of the seasoned oil into each bite. 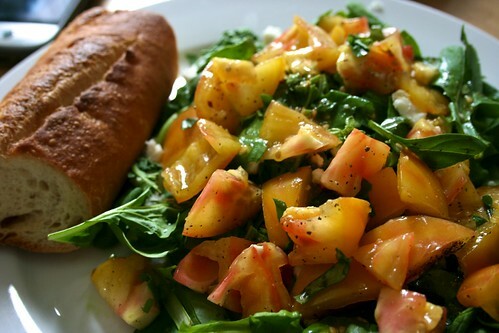 The crusty bread is nice to add into the bites of salad. It’s sort of a deconstructed tomato bruschetta. Just mix it all up and enjoy it. So tasty. So healthy. Really satisfying. 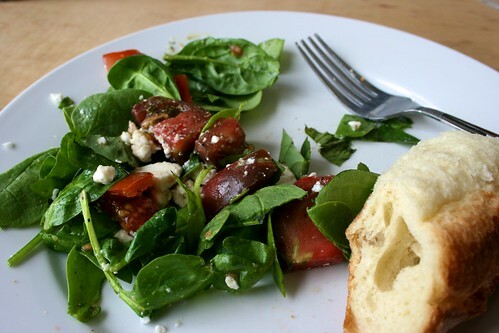 This is a nice basic salad that you could add all sorts of things to. I’ve added sauteed asparagus here, which was very tasty. A great simple salad without any fuss.